HEALING WORDS: The Power of Prayer and the Practice of Medicine. 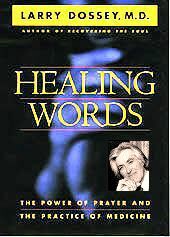 In the Preface to "Healing Words," Dr. Larry Dossey tells of how he was "surprised to discover a single scientific study [see my published critique] that strongly supported the power of prayer in getting well," and how it inspired a personal quest to "probe the scientific literature for further proof of prayer's efficacy." Soon Dossey, who had "planned to become a minister" before deciding instead to attend medical school, made the decision to pray for his patients: "I would go to my office earlier than usual each morning. . . . As the incense filled the room, I would invoke the Absolute. . . . I would shake several rattles and gourds, paraphernalia used worldwide by shamans and healers to 'invoke the powers.' . . . I felt a connection with healers of all cultures and ages." Dossey has since retired from active medical practice to write and lecture, and co-chaired a committee reviewing mind-body studies for the Office of Alternative Medicine at the National Institutes of Health. Dossey has come to the conclusion that God need not be 'up there' but rather that "the Divine factor in prayer is internal." Further, says Dossey, consciously directed prayers for a specific outcome are far less effective than prayers initiated unconsciously: "Unobstructed, the unconscious during sleep and dreams may be free to realize its natural, innate affinity with the Divine" (p. 71). Such speculative bridges throughout the book, and the puddles of "scientific" evidence that they serve to interconnect, evoke images of Percival Lowell's illusory Martian network of canals and oases. And any similarity in Dossey's philosophy to "negative psi" (whereby psychics' best results occur when not even trying) is no mere coincidence -- Dossey embraces many such parapsychological claims as among his strongest "scientific" evidence. Dossey's detailed discussion of the Southern Medical Journal's CCU study began predictably enough: "If the technique being studied had been a new drug or a surgical procedure instead of prayer, it would almost certainly have been heralded as some sort of 'breakthrough.'" But I was taken aback as Dossey then proceeded to offer an assessment of the study as critical as my own Free Inquiry critique (cited on p. 185). Despite his earlier praise of the study that had so inspired his quest, Dossey ultimately was left with the realization that "this study has missed the mark. . . . [W]e would expect greater evidence than a few small percentage points of improvement. We would want to see statistically significant life-or-death effects, which simply did not occur" (p. 185). Dossey concurs with the "many researchers [who] feel it is easier to study the effects of prayer in simple, nonhuman living systems (emphasis in original). Prayer experiments in simpler life forms are much less ambiguous, involve fewer variables, and are easier to interpret." He cites many "consistent, replicable, and robust" experiments from the parapsychological literature, and mentions "the late Olga Worrall, the well-known psychic healer," who demonstrated an ability to "protect" one of two samples of bacteria exposed to a toxic agent. The results, published in a 1980 parapsychology book, "showed that the 'protected' bacteria indeed survived in greater numbers than the controls, at levels of great statistical significance." Those results were also published in the Star tabloid, and a friend had promptly sent me the clipping. I then called Worrall on the telephone (both she and I were living in Baltimore at the time). When I introduced myself as a scientist who couldn't help but be a bit skeptical of her findings, she said, "Well, you're not a true scientist then. A scientist is supposed to be inquiring . . . but not with skepticism." Clearly, neither she nor the "scientists" with whom she worked had a clue as to the requisite role of skepticism in scientifically evaluating such alleged abilities. Having adopted the parapsychological worldview as his standard of reference, Dossey's subchapter on "Why Do Drugs Work?" becomes almost understandable: "[To] doctors and scientists in general . . . [t]he possibility that a physician's thoughts and beliefs could actually shape a patient's physiological responses [to a drug] -- at a distance, even when the patient is unaware -- is unthinkable. This has resulted in a virtual blindness in modern medicine to these issues, and an unconscious drive to deny demonstrated facts" (p. 138). A standard method of scientific experimentation is called into question: "It appears that double-blind studies can sometimes be steered in directions [by] the thoughts . . . of the experimenters. This might shed light on why skeptical experimenters appear unable to replicate the findings of . . . 'true believers' [who] seem more able to produce positive results" (p. 195). Nice try. But on those rare occasions when skeptics are invited in by "true believers" simply to review and tighten their notoriously lax controls, their positive results almost invariably evaporate. Dossey refers unflatteringly to the "many New Age health 'authorities' who speak and write endlessly of the marvelous results one can expect if certain measures are aggressively undertaken . . ." He seems to sincerely believe that he has little or nothing in common with them, since his entreaty is for the adoption, by doctor and patient alike, of an attitude of calm "prayerfulness," to open the gateway to the Divine and thus facilitate natural healing. I suspect that most of Dossey's readers will hear in his "Healing Words" a harmony of truth and majesty. Perhaps I am tone deaf, but all I hear is a cacophony of New Age psychobabble. A version of this review appears in the Summer 1994 Skeptical Inquirer and in the Summer 1994 Tampa Bay Skeptics Report.